URSU Sustainability Week runs November 6th-8th and it’s your chance to learn how to live more eco-friendly while also finding out about the different ways your Students’ Union reduce its impact on the environment. We’ll also be highlighting the various ways different groups and department promote practices that help the campus be a more sustainable place. We will have a documentary night featuring ‘An Inconvenient Sequel: Truth to Power’ on Monday Nov. 6th in EA 106.1 at 7pm. Then there will be a Composting Workshop Tuesday Nov. 7th a 6pm in EA 106.2. Our main event will the Sustainability Seminar and Panel Discussion on Wednesday Nov. 8th at 7pm in CL 126. One of our initiatives to promote sustainability is our professional clothing drive to support our new service, URSU Threads. 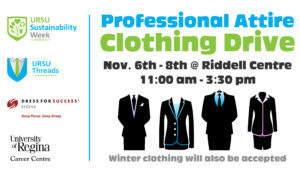 It is a service for our members, the students of the U of R, wherein we provide free professional clothing to students for job interviews and work terms. By taking donated suits and putting them in the hands (and on the shoulders of students) we help them see the importance of reusing items and make sure less garments end up in landfills. We are requesting faculty and staff members donate their gently used professional attire (male/female/gender neutral) to URSU Threads and Dress for Success to support our students and community members. We will be accepting donations in the Riddell Centre November 6th-8th between 10 a.m. and 3 p.m. We kindly request that the clothing should be gently used and on a hanger when donated. Please see the attached poster for more details and for more information about the URSU Threads program or the Professional Attire Clothing Drive please contact myself at vpext@ursu.ca.